Table of Contents: Feature: The Wonder of Trees, Things to Look Out for in April, Kudos, MEEA News, Grants, Contests and Awards, Conferences, Workshops, Jobs, Teaching and Learning: Project Learning Tree's Free Online Unit "Teaching with i-Tree"
If you’re receiving this newsletter, you probably know a fair amount already about the benefits of trees which includes carbon sequestration, stormwater mitigation, and the production of myriad products that humans use. Being around trees can even provide a boost to our mental health and academic success. We’re also beginning to learn how trees communicate and cooperate through airborne chemicals they release and through their mycorrhizal partners in the soil. Trees are truly magical, and we should all be amazed by them! So when it comes to trees, how do we spread this sense of wonder which is a precursor to action on their behalf? Early Childhood--This is the easiest age for the task because we simply have to direct the overflowing wonder and excitement in humans at this age. Whether it’s a classroom of preschoolers or a young child in your family or neighborhood, you can simply take a walk outside and go on a tree treasure hunt. Search for the biggest, fuzziest, or shiniest leaves you can find. Fly some maple seed helicopters or collect some sweetgum balls. Touch some tree bark and teach new vocabulary: smooth, bumpy, splotchy. Whatever you do, don’t underestimate the value of this work. Early childhood is abundant with opportunities to instill a love for nature that lays the foundation for an adulthood of action for the environment. Elementary years--At this age, we know kids unabashedly want to help and want to take care of living things. This age group also benefits from opportunities to take concrete action on behalf of the places they routinely visit. And they definitely like to have ownership of responsibilities, projects that are “theirs”. This age group will delightedly dive in to planting a class tree, creating schedules for watering, and learning how to monitor for pests. Plus, they’re always up for a good story. So read them a tree-centris book or gush about those tidbits of tree lore you’ve been carrying around! If you’re not a tree-tending expert, the Missouri Department of Conservation’s “Trees Work” website is a good starting point to learn about tree i.d., tree benefits, and tree care. Middle and High School--If you’ve been around kids these age, you know that money talks to them. A free and easy-to-use online tool called i-Tree is sure to inspire wonder in this age group--it calculates the monetary value of tree benefits like stormwater capture, energy savings, and carbon sequestration. Jaws may drop when teens see the connection between how much CO2 is captured by a tree over the course of its lifetime and how this correlates to the amount of CO2 released by driving a car or taking a plane ride. Project Learning Tree has partnered with i-Tree to develop a free curriculum unit available online to teach middle and high schoolers how to use the software and begin to think about land management using trees. Details in the lesson portion of the newsletter. Adults--We often think of EE as for children, but many adults have missed out on it and need the education too. I’ll admit it, I have not always given a lot of thought to trees, having spent more time in awe of smaller plants sprouting from my vegetable and perennial gardens. It was Peter Wohlleben’s book, “The Hidden Life of Trees”, which ignited excitement and wonder about trees for me a few years ago. This book tells stories of trees helping one another, partnering with fungal organisms to create trade routes, and even coordinating events like mass seed releases. This book was the final straw that moved me to hire an arborist for the trees in my yard. And this was my pick last year for a book club (in which I am the only professing plant lover) where it was enthusiastically received. One friend even commented that she’ll never look at trees the same way again. This new way of looking at trees seems to be rekindling wonder in a lot of adults, as I see the topic popping up everywhere, from Netflix to social media! Certainly, we want people to move beyond a simplistic view of trees as somehow magical. But for many, that's where we need to start and it's how we gain the momentum that leads to knowledgeable action. Trees are wonder-full, so let’s dig in and spread the love! •Arbor Day Foundation-–free trees for schools and lesson resources as well. •Missouri Department of Conservation --Inexpensive trees in bundles of 10 or 25; these small trees will grow fast, great opportunity for elementary students to collect data on rate of growth. •The Giving Grove (KC) and Gateway Greening (St. Louis)--If you work in a school garden, you know that students clamor for fruit! These two organizations can help you access fruit trees and shrubs suitable for Missouri schoolyards. •Forest ReLeaf--Free native trees for public spaces like parks and schools and a summer camp for 5th and 6th graders June 3-9; after the tornado in Joplin, Forest ReLeaf provided a multitude of replacement trees. • Forrest Keeling--Family-owned nursery that switched to growing all natives after a devastating freeze decades ago wiped out all but their native nursery stock; they have a growing method that incorporates mycorrhizae and has positive impact beyond the nursery to the soil surrounding the planting site. • Field and Forest https://www.fieldforest.net/--when it’s time for a tree to come down, give it new life by growing edible mushrooms on the logs! Things to Look for (or Look Out for) in April! Kudos for Jan Weaver's longterm dedication to environmental education and tremendous gratitude for her logical brain! Jan systematically worked with teams of people over the years to develop all the resources that MEEA has to offer. She has left MEEA in a great position, having such a wide variety of offerings. Lesli's job is not to create anything new right now, but to make MEEA more accessible to more people. Thank you, Jan! Membership Drive happening in April. Look for an email reminding you to renew or upgrade your membership! Memberships - Welcome to new members Carrie Byron, Jared Cole, Lara Landrum and thank you to renewing members Tyler Britt, Meredith Donaldson, Eric Hadley, Elizabeth Petersen, Kristen Schulte, Geoffrey Stillwell, Harry Waters and Institutional Member Washington University Tyson Research Center. Networking - Lesli attended a variety of educational and networking events in St. Louis during her first month as ED, including programs about i-Tree, BiomeSTL, and University Extension. Outreach - An outreach task force was created at the March Board meeting, with Hannah Hemmelgarn, Laura Seger, and Jan Weaver. If you know of events where MEEA should be represented, please send info to Lesli Moylan at moylan@meea.org. Partnerships - MEEA has been invited to the partnership party for the Sustainability Institute for Educators conference that takes place every June in St. Louis. We accepted, of course. MELAB - meeting coming up on May 9 from 10am to 3pm in Jefferson City at DNR's Lewis and Clark Building. Conference - Laura Seger (President Elect) is the Conference Committee Chair. She reported at the March board meeting that next year's conference will be on November 2 at the St. Louis Zoo. A Friday night social (location TBD) will be held November 1, and optional tours of green educational spaces will take place on Sunday, November 3. Missouri Green Schools - The US ED Green Ribbon Schools will be announced May 22, stay tuned! MELAB Members have continued to refine the MO Green Schools application, using a leveled system to enable MEEA to show participating schools a pathway to GRS designation and honor schools at points along the way. Accounting - Jan Weaver presented the January/February financials, which were approved by the board. She's working on the 990 EZ. Fund Development - Committee formed at March Board Meeting, with Sarah Holmes, Meredith Byers, and Jan Weaver joining the team. If you'd like to help let us us know, members welcome to join! Administration - At the March meeting, the board formed a task force to develop a calendar of potential outreach events and formed a fundraising committee and a website committee. Board members will each contribute 1-2 feature articles or lessons annually for the newsletter. This experiential education unit for middle and high schoolers consists of three parts, each with 2-3 approximately hour long lessons. The unit is designed to familiarize students with the i-Tree software (which quantifies the monetary value of some tree benefits), teach the basics of tree identification, and introduce the idea of land management. Lessons are indexed to the Next Generation Science Standards. Part 1: Students begin by learning to use i-Tree at https://www.itreetools.org, but it's also available as a phone app. The software is intuitive and really easy for beginners to use, with good training tools. You will need to input the species for each tree you want to calculate benefits. Tree identification tools are not part of the software, but are included in the curriculum unit. If you aren't confident in your tree i.d. skills, you may want to bring in a local arborist or ask for help from your school's grounds manager (assuming you are conducting these lessons on school grounds). I-Naturalist, an identification app that is gaining popularity with educators, is included as a potential tool in the unit. FYI: the Sustainability Institute for Educators in June includes a workshop on how to effectively use this app with students! Part 2: Students put the skills they learned in Part 1 into action by collecting data and entering that into i-Tree. This is where jaws may drop, as reports translate abstract quantities of stormwater absorbed or CO2 captured into relatable units such as loads of laundry or miles driven. Students use this information to create an "Ecosystem Services Guide" for others who visit the space where data collection occurred. Part 3: Land Manager Role Play. This is were students can play around with the impacts of different design strategies and develop a management plan. They can see the impact on energy savings depending on tree placement or select trees based on parameters such as levels of allergens produced or stormwater mitigation impact. And they can develop plans that might be implemented in real life. Whether it's a pitch for tree maintenance funds to the PTO, a planting recommendation for the administration, or even a call to action for a city council, this communications piece is so exciting because it demonstrates the power of data and the importance of sharing knowledge! NOTE: One limitation of i-Tree currently--it doesn't go beyond climate zones or include information about invasives, so you need to research which species would be most appropriate to add to your landscape plan. Most Project Learning Tree resources require a training prior to use, but this unit does not. 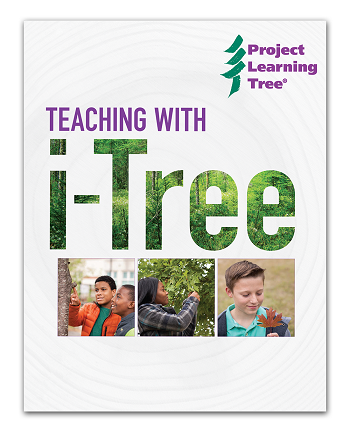 Register as a PLT user, login, then select "Choose Your Free Curriculum" to find Teaching with i-Tree. PLT is a great resource, and this unit is a risk-free way to see if PLT resources might work for you before investing in the training. Trainings are offered as in-person workshops or online and range from $25-$50. Want the training but the cost is prohibitive? Why not apply for a MEEA mini-grant? Applications are typically due in the fall.